The very bestest illustrators out there, on a crusade of illustration in pursuit of perfection in fresh colourful narrative work. 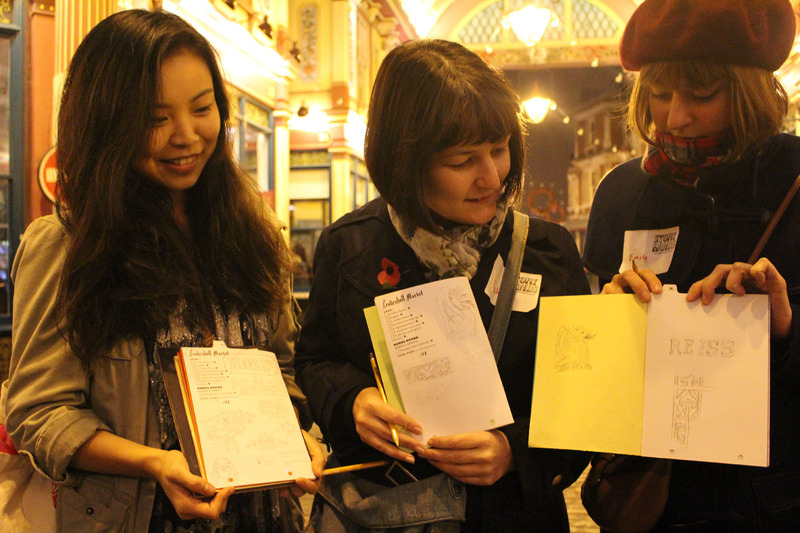 What do you get when you take two amazing StoryHands co-founders, Jenny Robins and June Sees; around twenty (times four) members of the public; unique handmade sketchbooks made from a mix of responsibly sourced Children’s Scrap Project resources; pencils and pastels provided by Seawhite of Brighton and then take them all exploring and drawing in the City of London? The best day out ever obviously. Very important warm up cocktails with Anna and Frances. 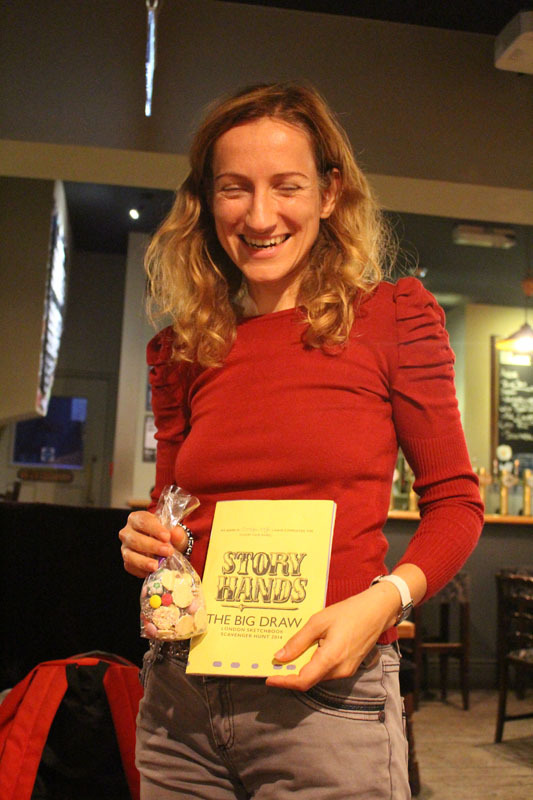 Our first shot at organising an event for the international festival The Big Draw was a great success. 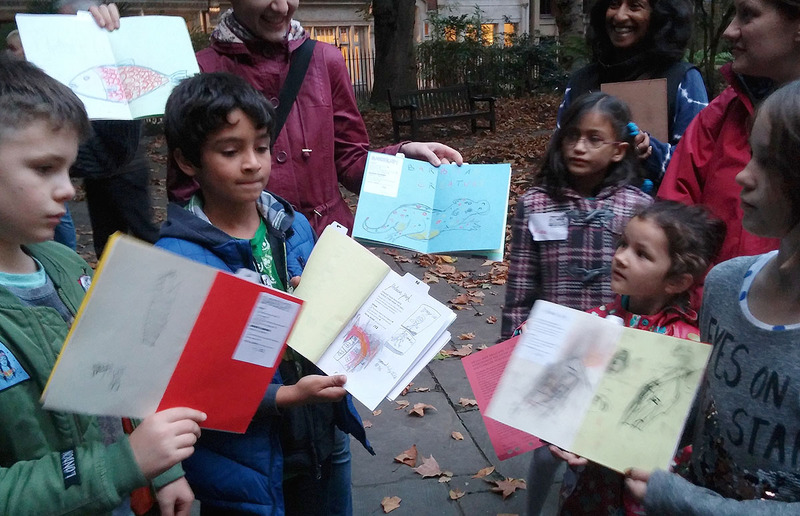 Every October the Big Draw includes all sorts of amazing projects, often organised or hosted by museums, schools and other big institutions who have spaces to draw in. 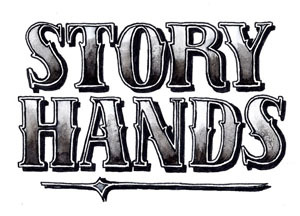 Since we basically run StoryHands out of our small and crowded studios, bringing groups of people to us wasn’t an option, so we came up with the idea of doing a walking tour in London. 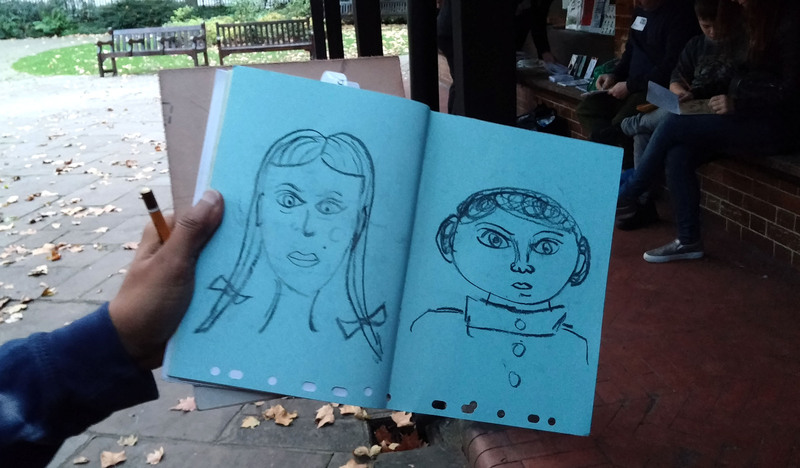 With four outings along the same route, we targeted two separate groups of people with the same drawing activities – in the afternoons our scavenger hunt was family friendly and in the evenings it was for over 18s only and included a pub crawl. 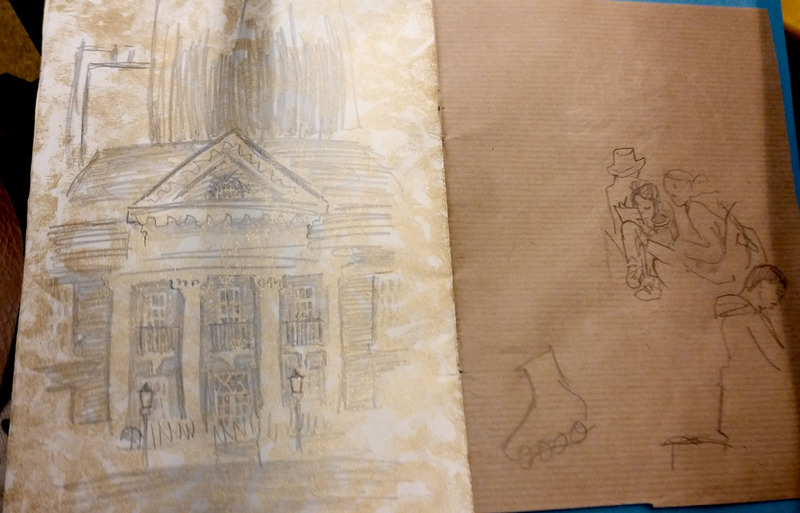 It was great to see the enthusiasm and courage that both groups attacked our drawing challenges with, true the adults may have been a little more sophisticated in their responses, but I think the children were definitely braver at tackling more tricky subjects. June demonstrates the no stick men rule. 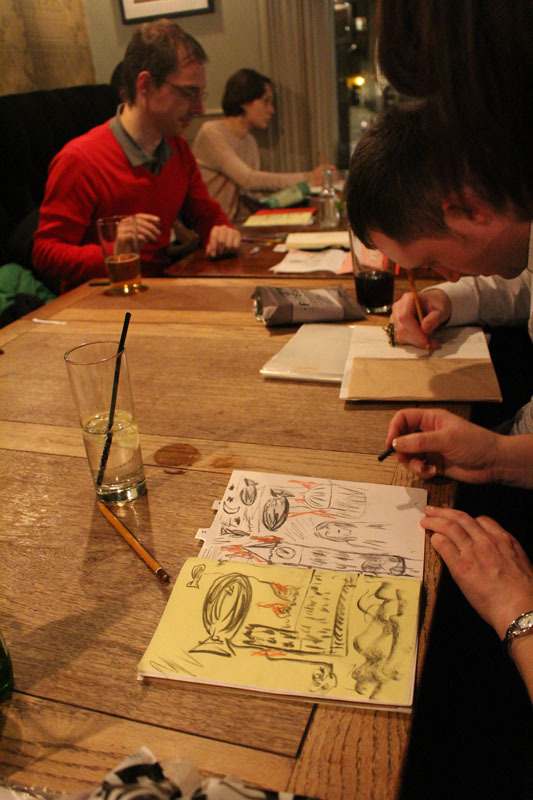 We had only one rule – no stick men or similarly simple line drawings! The British Capital really is an amazing city, with so much to see and such interesting history that it’s difficult to remember to make the most of, so this ties in nicely with this year’s Big Draw theme of ‘It’s Our World’ – as well as using recycled materials for our sketchbooks, we wanted to really encourage people to look and take ownership of the wealth of detail and diversity in not only the architecture of London, but it’s everyday ever evolving life. The overlapping history of the various stages of destruction and growth make London what it is today, and we highlighted this by beginning at the Monument to the Great Fire of London – a reminder of one of the most famous tragic events to clear space for new development in the City, and also a site for spotting some very emotive plaster work. 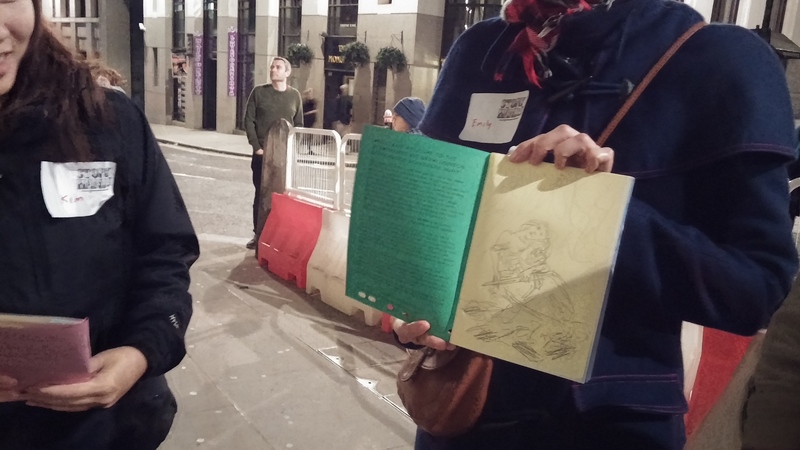 We challenged our guests to draw someone who had lost their house in a fire in only 3 minutes. People who lost their homes in a fire, lots of red and yellow Seawhite pastels. 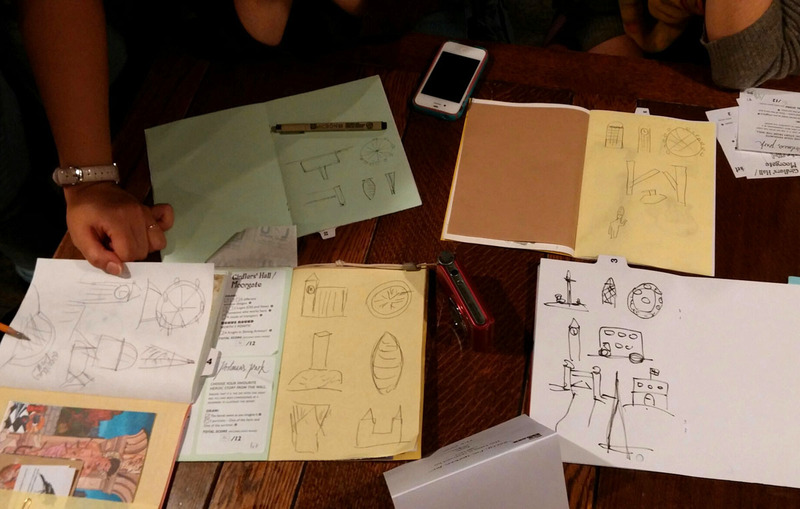 At four strategically planned locations in the City, we gave our guest members (StoryHands artists for the day) lists of things to find and draw in only 15 minutes. These were not easy challenges, but each time our new friends rose to them, getting faster and better with each stop on the walking tour. 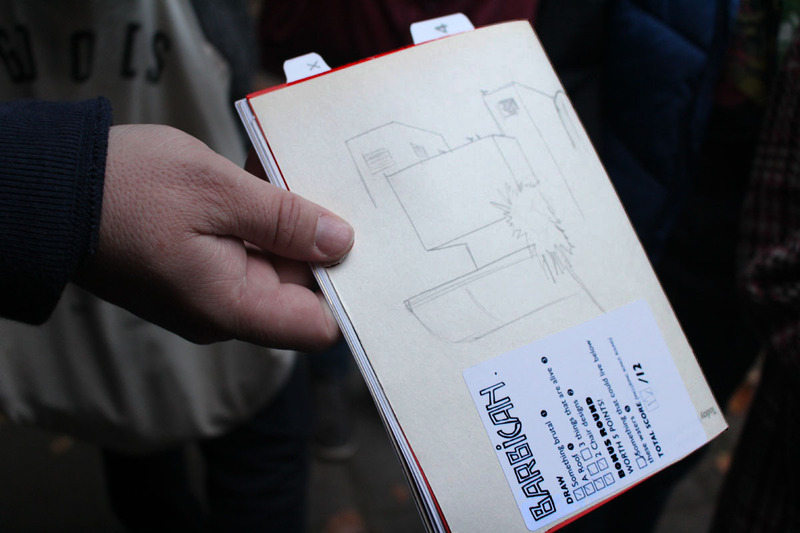 Everyone who gave us feedback after the events said they loved learning about parts of the City they hadn’t seen before and being encouraged to really look at the details of the buildings and environments around them. Every time we set off for a new destination I renewed my call to look up, look around, see the details of the amazing variety of buildings, notice the signage, the statues, the sites famous and obscure. 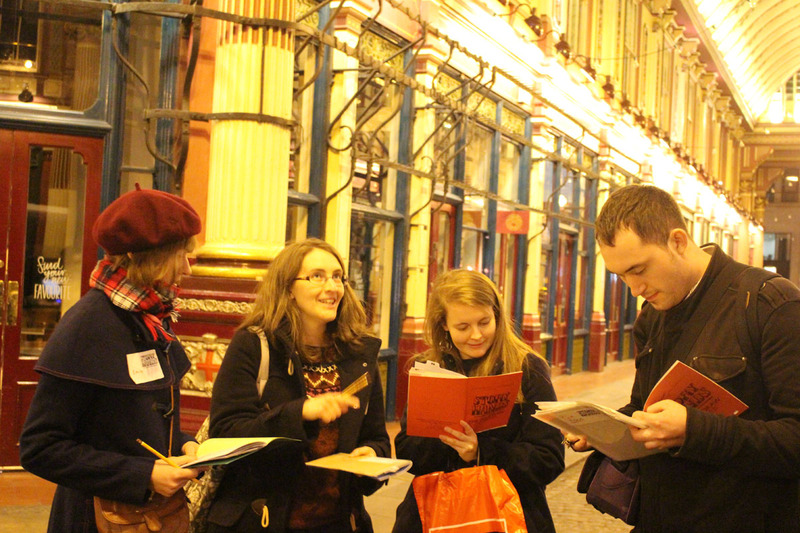 In Leadenhall Market we challenged our walkers to hunt and find such cryptic items as a Golden Fleece, and the Space Time Continuum, but also asked them to peer into windows and use their own discerning judgement to pick out lettering, gifts and menu items that appealed to them. 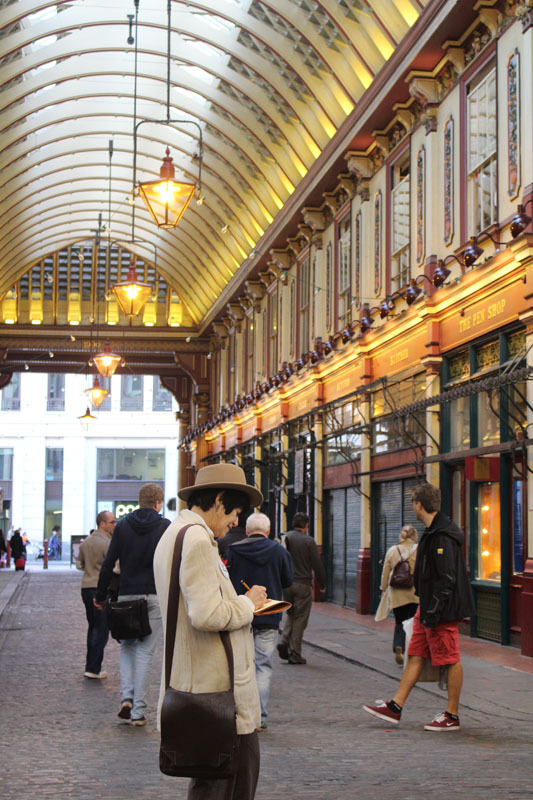 The site of the market is a feast of Victorian elegance, the set of Diagon Alley in the first Harry Potter film, but also the centre of Roman London. We stayed mostly within the confines of the original walled Roman City during both day and evening walks. 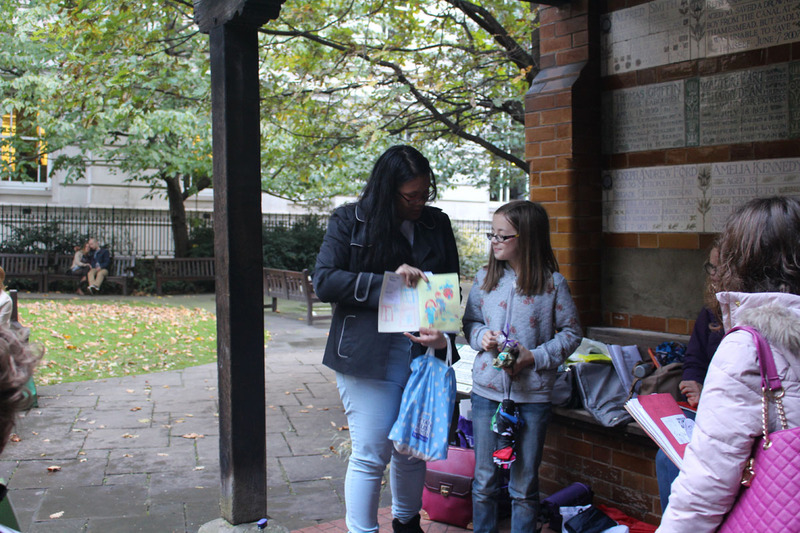 Sue Grayson Ford, Director of the Campaign for Drawing joined us for a portion of our family walk on the 1st of November. At Girdler’s Hall we stopped again to look at this surprising sight of a manor house and gardens, nestled among skyscrapers, tucked away opposite Moorgate Station. 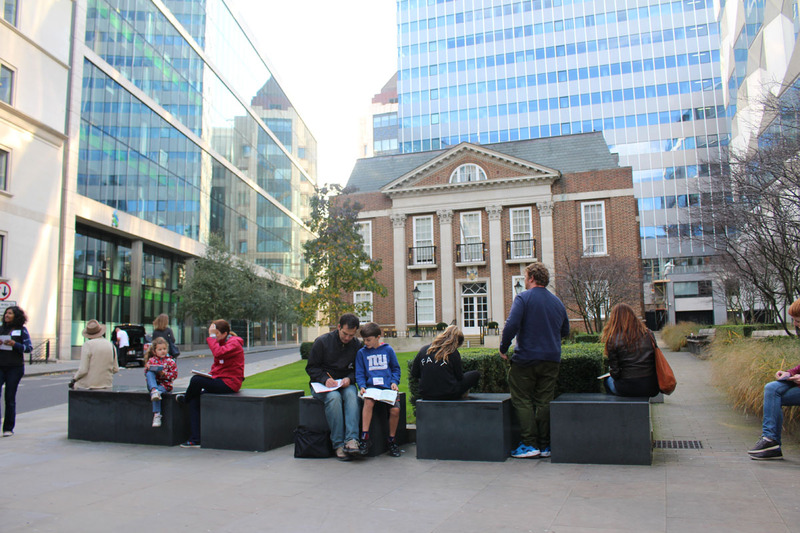 This was a great place to talk about the coexistence of the old and the new in London, and about the power that livery companies like the Girdlers have exerted to keep little pockets of ancient ownership in the centre of town safe from modern development. 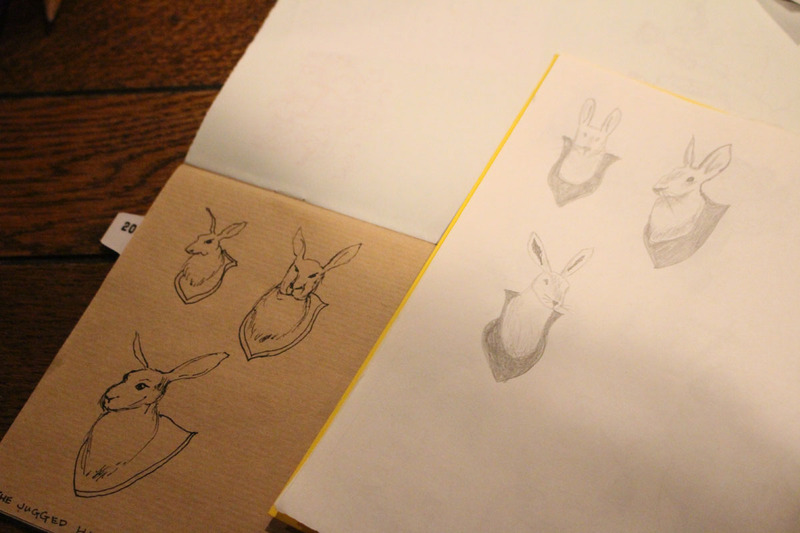 At this point on the adult walk we stepped in to the Jugged Hare, for an optional beverage and a bonus drawing task – to draw one of the many charismatic hares that live on the wall there. 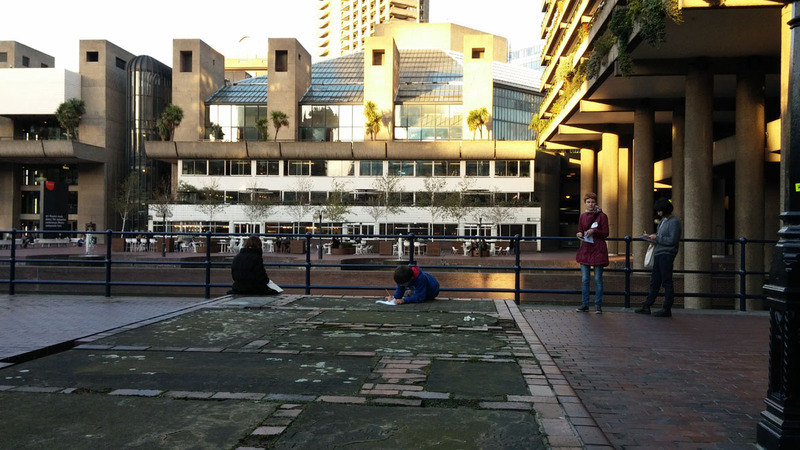 Our next stop was the terraced gardens within the Barbican Centre. In contrast with the large number of more classical venues and municipal buildings we’d just walked past, this enormous multifunctional edifice of brutalism is an amazing self contained environment where 4000 people actually live right next to the city. 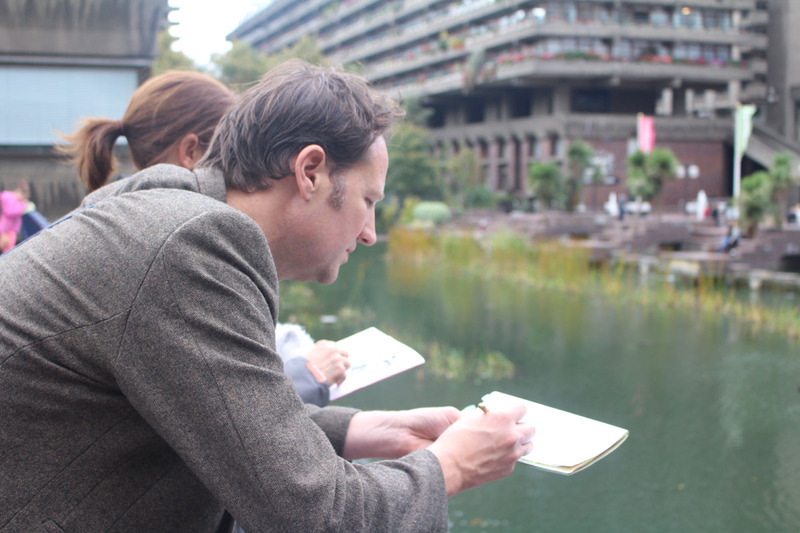 It’s easy to get lost in the Barbican, but we managed to escape all 4 times with all members of our drawing party, and a lot of inventive and cunningly observed drawings besides. 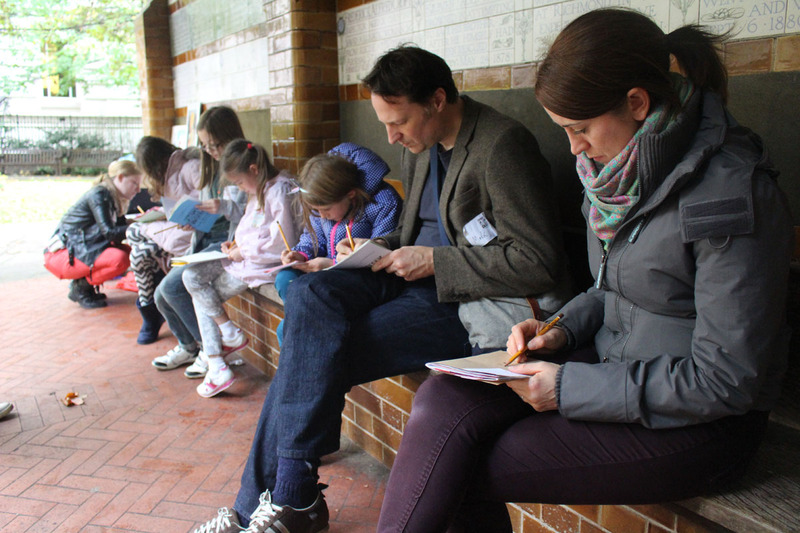 On the day walks we visited Postman’s Park as our final stop. At first glance this little gated piece of greenery is much like many of the other small public spaces in the area of St Paul’s, but it is also famous for it’s Memorial to Heroic Self Sacrifice, a wall of plaques commemorating people that had died in the act of saving the lives of others. Here we asked our guests to call on their imaginations to picture the people and situations involved in these moving stories from minimal information, and to enter a little more into our world as illustrators as we commissioned them to illustrate a newspaper report on the incident of their choice. 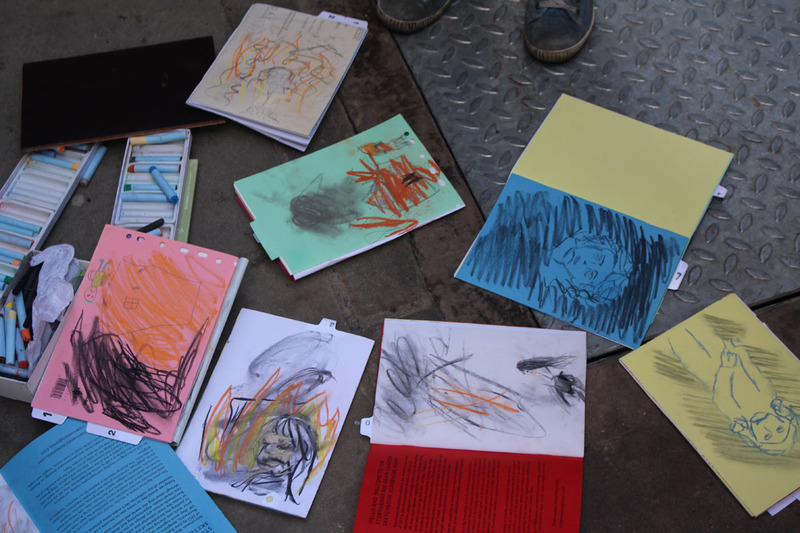 Here both adults and children really excelled at creating original characters and lots of red and yellow pastel was used to fire again! 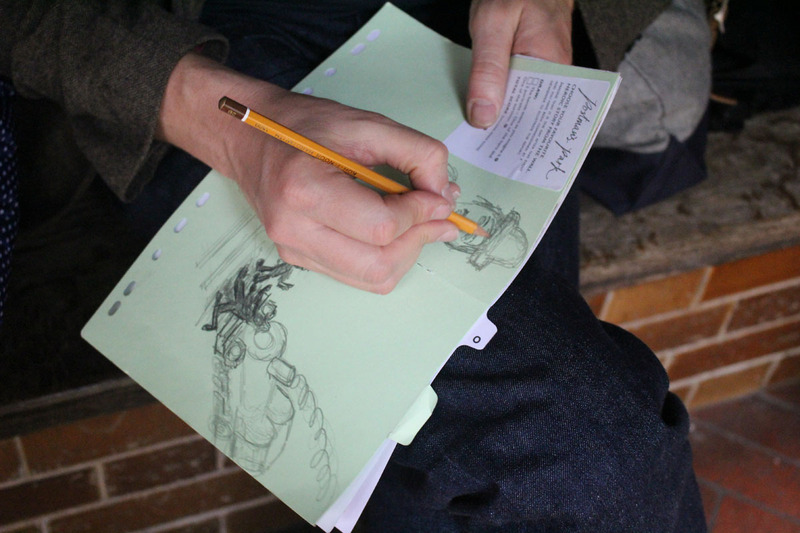 Illustrating the heroic event and imagining portraits of both the hero and the survivor. Unfortunately Postman’s Park shuts at sunset, so we were unable to take the evening group to visit the memorial. 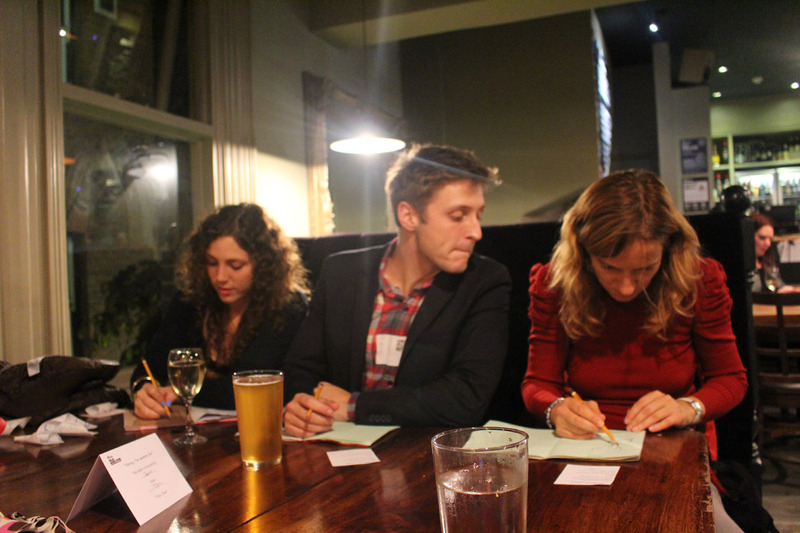 They took the substituted pub visit in their stride however and so we hit them with a variety of timed drawing tasks in the Old Red Cow. 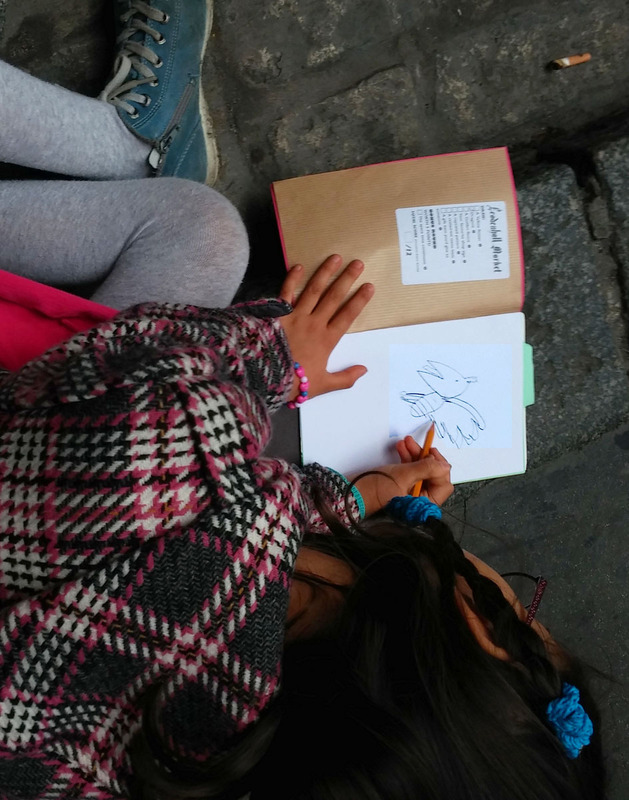 These were quite different across the two evening walks as we decided we’d been too easy on them the first time round, but both groups produced brilliant imaginative drawings. Illustrating key historic events of London. 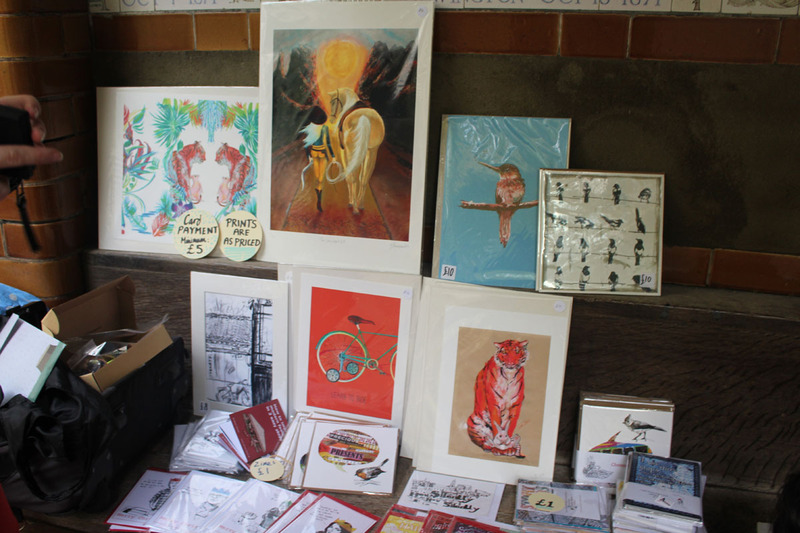 We also had the opportunity to display and sell some of the StoryHands artists’ wares at both walks, offering exclusive deals and one off prints. The Christmas cards did well unsurprisingly for the time of year, as well as some old favourite Magpies and Tiger and Rabbit prints. 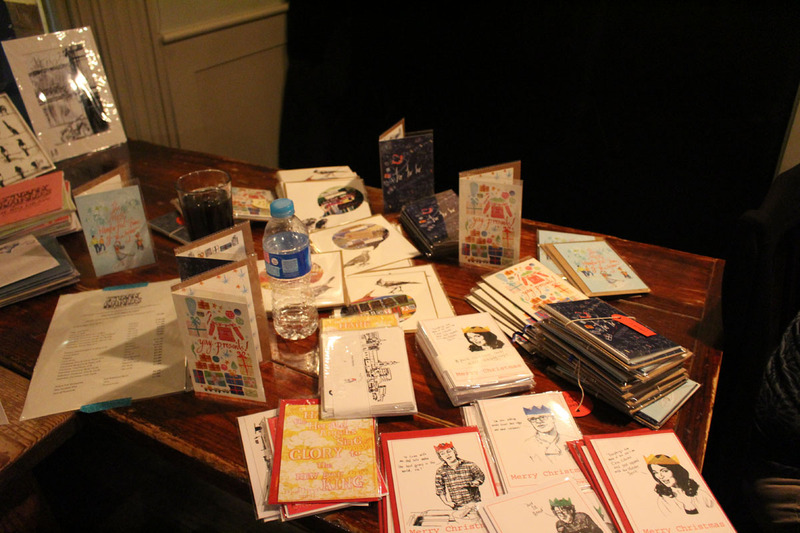 Christmas cards by StoryHands artists were sold alongside prints and zines. Each challenge in the Scavenger Hunt came with associated points, and of course points mean prizes. 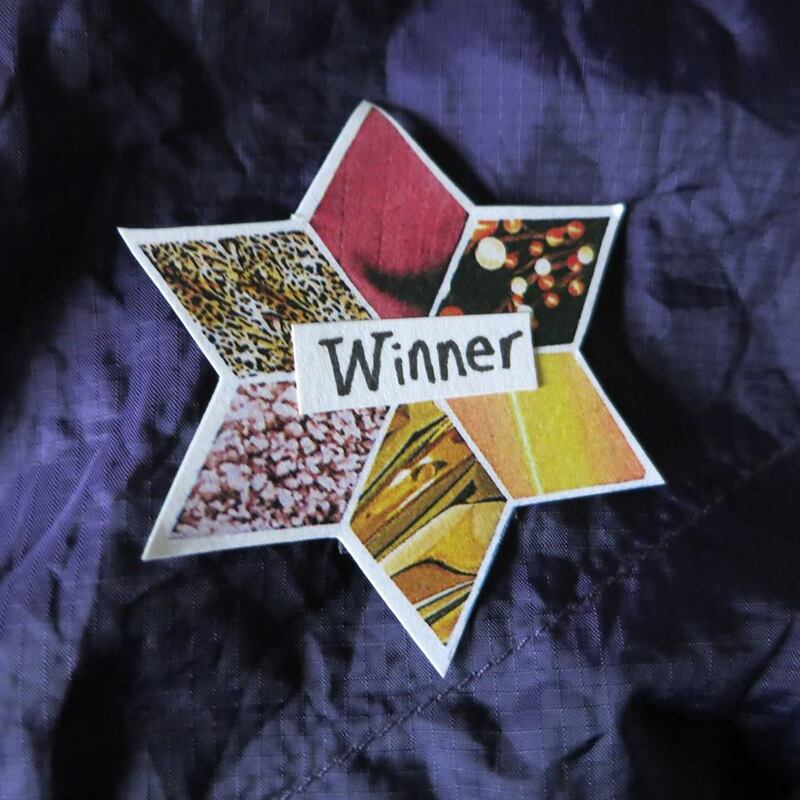 The winners of our prizes completed the most drawing tasks, but we also gave commendations and awards for creativity and observational skills. Congratulations again to all those who won. Winners were presented with prizes and badges. Overall we pronounce our first walking tour event a great success and would like to reiterate our heartfelt thanks to all those who took part, to the Big Draw and the Family Arts Festival for having us in their roster this year and espcially to Sue Grayson Ford, Director of the Campaign for Drawing, who joined us for a portion of our family walk on the 1st of November. We also owe huge thanks again to our sponsors the Children’s Scrap Project and Seawhite of Brighton. A big thank you as well to Rob Clarke, June’s amazing husband who was a massive help on the second walk and not a bad artist himself as it turns out. These photos can also be seen on Facebook, if you spot yourself feel free to tag yourself up there. 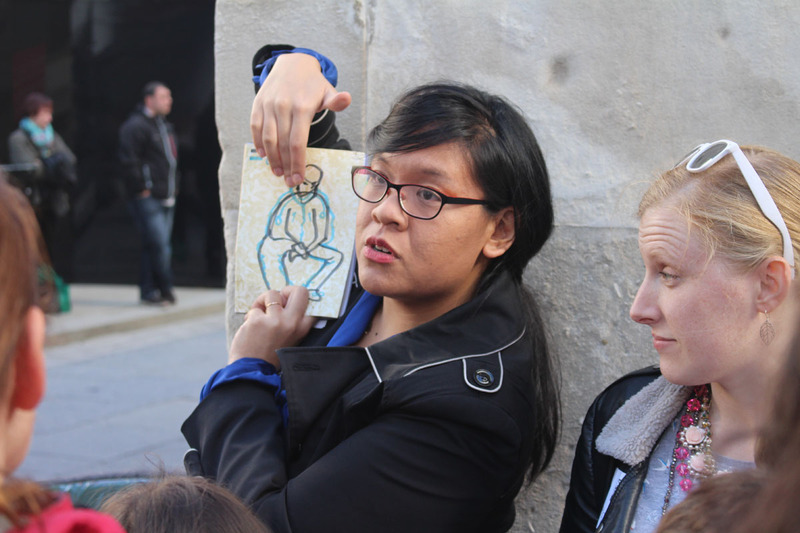 We may decide to repeat this event next year, but now we have revealed our route here we will need some more sites to visit to keep the air of mystery for a second edition of the Sketchbook Scavenger Hunt. 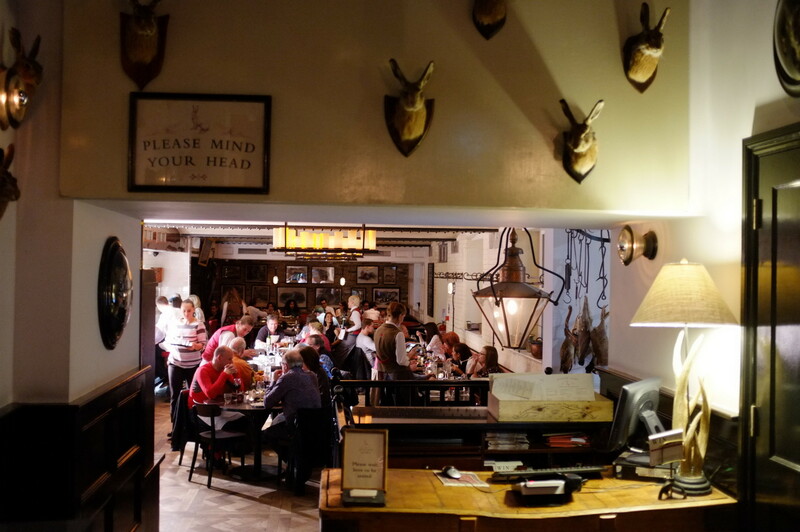 If you know of any interesting lesser explored sites in the London area or elsewhere, please let us know in the comments section or by email if you really want to preserve the secrecy of your favourite spot. 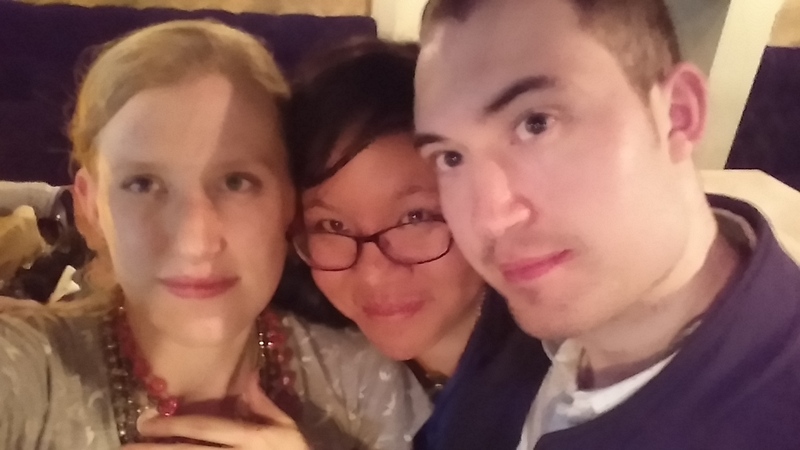 Tired but feeling pretty proud of ourselves – Jenny, June and Rob at the end of the day.